Moving time: 5 hr 22 min. Weather: 58°F (14°C) in the morning; got up to 85°F (29°C) by the end of the ride at 3:00 pm. Pretty much the same as yesterday but partly cloudy. More of the same riding early in the morning. It was nice not having a head wind and I did a great deal of descending today. The roads continue to have wide shoulders, the traffic is light, and the grades are extremely manageable. 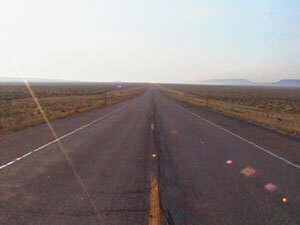 This shot was taken shortly after dawn just north of Jeffrey City. It rained very hard last night in this area and the air was far more humid than it has been. In fact, I broke a sweat for the first time in weeks today while riding out of Lander. The air has been so dry in the last few weeks that perspiration evaporates immediately. The sky is slightly hazy and a little humid, making the distant hills barely visible. We had breakfast at the restaurant/bar/gas station in Sweetwater Station. They received a tremendous amount of rain and hail last night. The hail was so heavy that the gas station owner had to shovel it away with a snow shovel. The topography and vegetation changed dramatically today as I descended from the Beaver Divide plateau to the Little Popo Agie River. 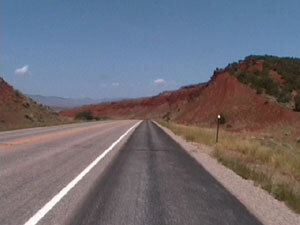 The Red Canyon exhibits very red rocks and there is far more vegetation including larger trees and greener grass. The first shot shows the descent into the Red Canyon. 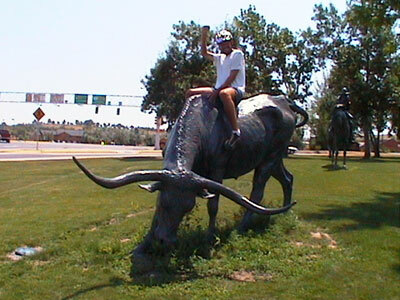 We met up with Randy and Chris again today in downtown Lander just after Joe took a picture of me rustling a bull. The second picture shows me, Joe, and Chris. Randy is sitting out of view on the ground just behind the bike in the foreground. Lander lies near 5400 feet above sea level. This is the lowest elevation that I've been at since leaving Pueblo, Colorado. In the next two days I'll have to climb above 9600 feet to go over Togwotee Pas. I stayed at Ray Lake Campground & Cafe with Joe, Randy, and Chris. Joe & LuAnn Malek own the place and LuAnn cooks in the cafe. 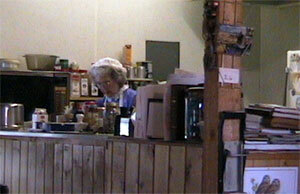 It's a great little place with excellent home cooked food and great pie "fresh from the crust up," as LuAnn says. 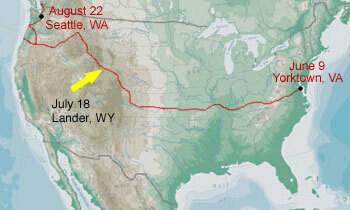 The campground lies within the Wind River Indian Reservation, home to Shoshoni and Arapahoe people. A substantial storm brewed up after dinner and the town received a great deal of lighting and about half an inch of rain. They can use every drop since it has been so dry. The ground was soaked after the storm so we decided to stay inside. We stored our gear in the men's bathroom and slept in the women's bathroom since we were the only campers at the campground. Here's a shot of Joe writing in his journal and Chris preparing dinner next to the bathroom stalls.